We had a bit of a Samoa situation this year (okay, in all fairness we have a bit of a Samoa situation every year but usually the situation involves little more than me wishing I hadn’t eaten all my Girl Scout cookies so quickly) — there was a bit of a mix-up with our order this year and instead of five boxes my favorite caramel and coconut-topped cookies we ended up with two. Two! Plus, three boxes of Trefoils (groan). After pouting around the house and making a big stink about it, pretending that all my banter was in a spirit of good fun (between you and me, it wasn’t), I decided that my two best options were to either make Samoas from scratch or to find a way to turn the Trefoils into a Samoa-inspired treat. I decided that the second option was better — I could find a new way to enjoy the flavors of my favorite Girl Scout cookie AND I could get rid of those three blue boxes sitting on my counter; three blue boxes that should have been purple! After a bit of thinking and a few text messages to my sister (she’s a really good baker who always helps me make up my mind when I’m torn between two equally good ideas), here’s what I came up with. This recipe has a lot of steps but you’ll find that each one is easy. And, the same basic ingredients are used throughout the recipe. This pie is well worth the time, effort, and waiting. First, make a crust for the pie by combining the cookie crumbs, granulated sugar, and melted butter in a bowl. Stir until combined; the mixture should resemble wet sand. If it seems dry, add more melted butter about a tablespoon at a time. Press the crust into the bottom of a pie pan and up along the sides. 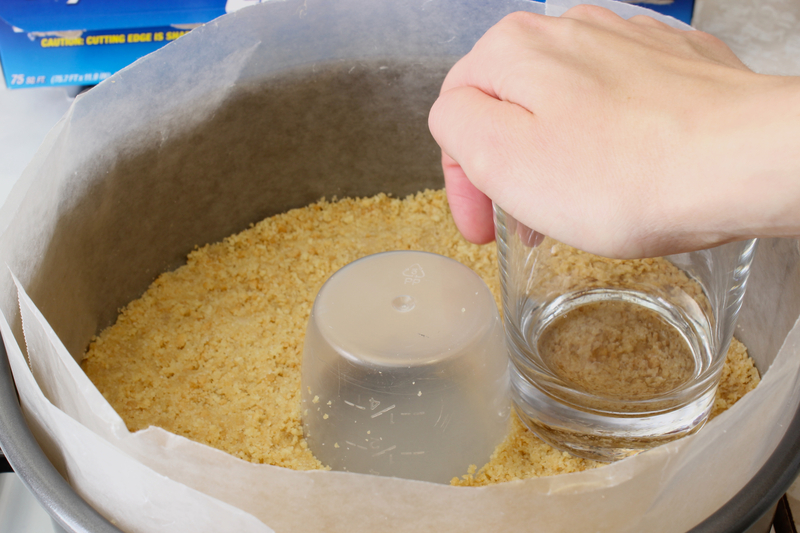 Or, to make the round Samoa cookie shape pictured above, press the crumbs into the bottom of a spring form pan that has been lined with waxed paper and fitted with a cup in the middle, as shown below. Whatever you choose, press the crumbs with something flat (like the bottom of a glass) to make sure the crust is even and well-packed. Then, make a chocolate ganache (to resemble the chocolate layer on the bottom of the Samoa cookie) by heating the heavy cream just until it comes to a boil. When the heavy cream boils, pour it over the chocolate and set the bowl aside for 3 minutes. 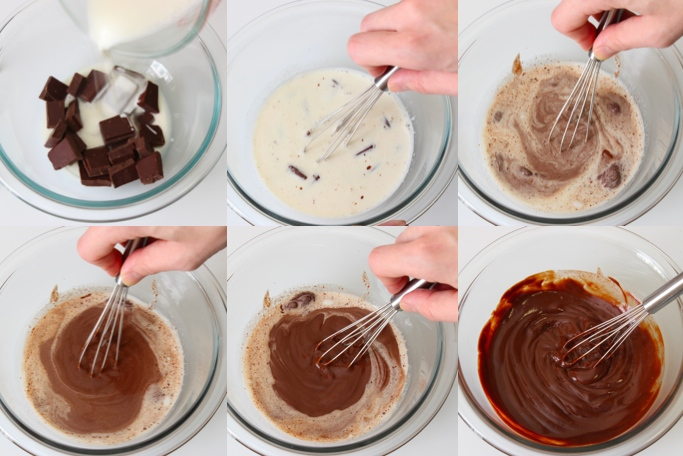 Then, whisking only from the middle of the bowl, stir until the chocolate and heavy cream are fully combined. Pour the rich chocolate sauce over the cookie crumb crust in an even layer. Put the pie in the refrigerator while you make the other layers. Beat the cream for the caramel cream filling in the bowl of an electric mixer until soft peaks form. Move the whipped cream to a separate bowl and, without washing your mixing bowl, beat the cream cheese, powdered sugar, and caramel sauce until fully combined. Then, slowly fold in half of the whipped cream, trying your best not to deflate the cream. Once the first half of the whipped cream is folded into the cream cheese, fold in the remaining portion. Then, spread the caramel cream on top of the chocolate ganache in an even layer. Put the pie back into the refrigerator. 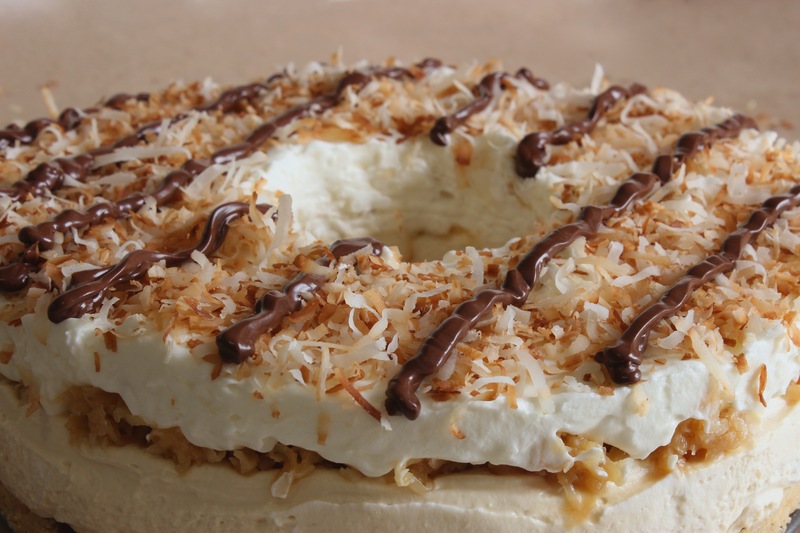 In a small bowl, simply stir together the caramel sauce and shredded coconut for the coconut-caramel layer. Then, using your hands, drop small pieces of the mixture onto the pie, doing your best to cover the whole pie in an even layer. In the bowl of an electric mixer, beat the heavy cream and powdered sugar for the coconut whipped cream. 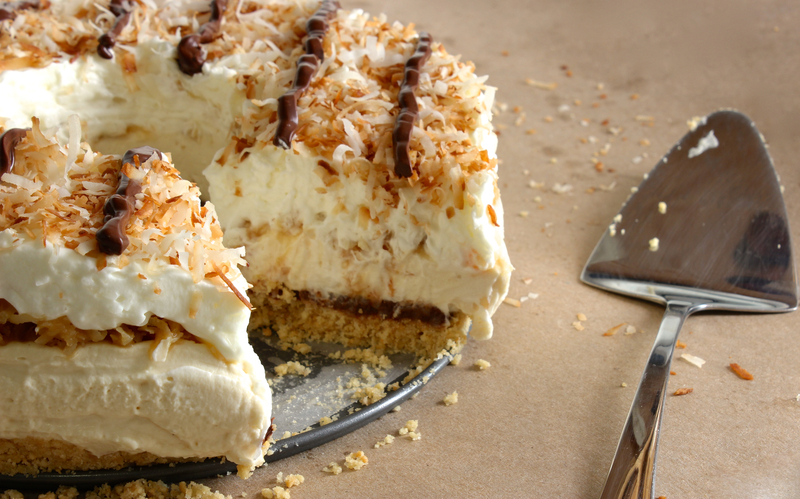 When stiff peaks form, gently fold in the shredded coconut and then spread the whipped cream on top of the pie in an even layer. Cover the pie loosely with plastic wrap and refrigerate overnight. When you’re ready to serve the pie put the remaining cup of shredded coconut into a frying pan and toast it over medium heat, stirring frequently. As soon as the coconut starts to take on a golden-brown color, pour it out of the pan and onto a plate, allowing it to cool completely. 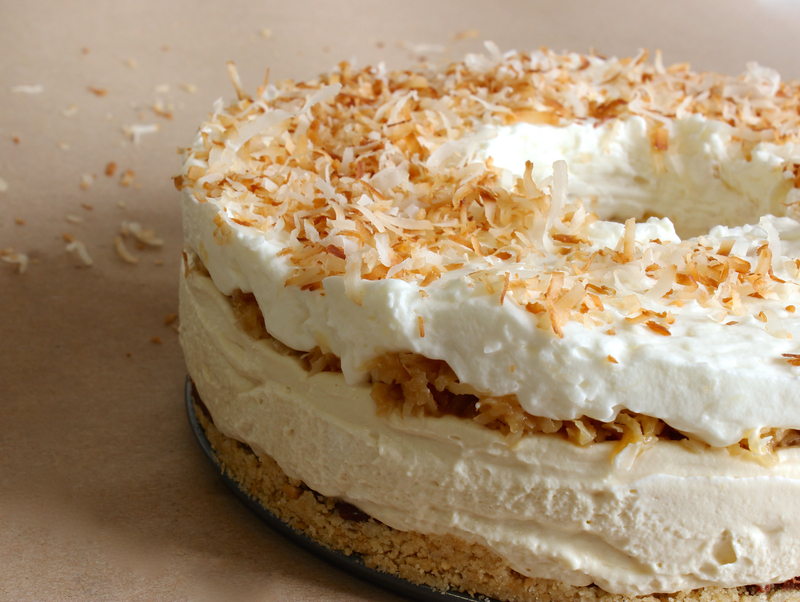 When the coconut is cool, remove the pie from the refrigerator and top with an even layer of the toasted coconut. Then, melt the chocolate and drizzle or pipe stripes over the top of the pie to resemble the stripes on a Samoa Girl Scout cookie. OMG. This looks insanely delicious!